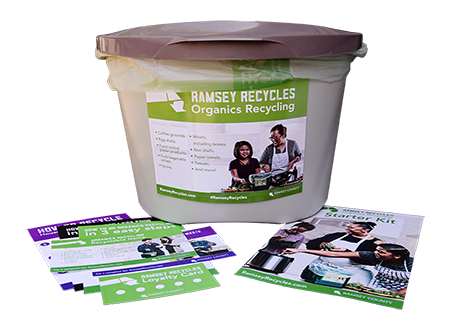 Ramsey County is again offering free organics recycling starter kits to make it easy to recycle food scraps and soiled paper. The starter kits include a small bin with locking cover, compostable bags, step-by-step instructions and reminder magnets. Kits may be picked up at Ramsey County yard waste sites during normal site hours; just ask a site monitor about the kits. Residents can also participate in an organics recycling loyalty program to earn a free t-shirt. Posted on Wednesday, July 11, 2018 - 12:00 p.m.